Strange things are afoot in the former Xavier School. Having been forced to flee from the continuing persecution of homo-superior following the fallout from the actions of Cyclops and the Inhumans, the X-Men, thanks to Magick, as X-Haven begins, are now located in Limbo, far from the prying eyes of humanity. But time is running out for the X-Men and mutants as a whole, as the Terrigen incident has had another hidden effect, one that no-one could have foreseen until Beast searching for a cure discovered the awful truth. That being exposed to Terrigen has also rendered all of mutant kind sterile, and as such, the current generation of their species will be the last. 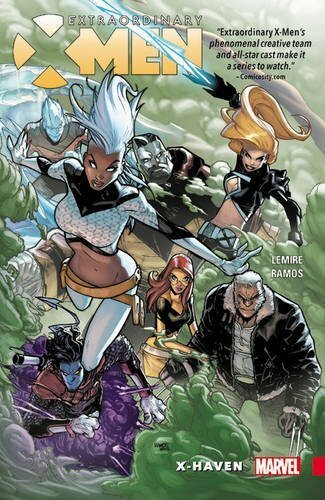 Facing an uncertain future, Storm decides to recruit a team of X-Men who will help her face the unseen and unexpected challenges that are bound to cross their path. Which as it turns out, is easier said than done and leads to the school having to face, and fight, a demon horde, confront an old foe, one hell-bent on fixing the Terrigen “issue” in his own horrifying manner, and his latest recruits and welcome some familiar, and very welcome, faces back, as Jean Grey, Colossus, Nightcrawler and Old Man Logan return to the fold.